Save the date and plan to join us for Tu BiShvat, the New Year of the Trees! RSVP to rabbibarenblat at gmail dot com or call the office at 413-663-5830. Join us on Feb. 7 for a Tu BiShvat Seder & Shabbat Potluck Feast! Please RSVP to office by Feb. 4. In today’s parsha, Yitro, Moses receives some of the best self-care advice in the Torah: you can’t do it all yourself. You will wear yourself out, and then you won’t be able to help those whom you serve. We’ve all been where Moses was: overworked and stretched too thin. Self-care matters. If we don’t nourish ourselves, then we can’t do the work we’re here to do in the world. Whether you think of that work as “caring for your family and community,” or “saving the planet,” or “serving God” — we all have work we’re meant to do in this life, and if we don’t take care of ourselves, we can’t do that work. Today at CBI we’re celebrating Tu BiShvat, the day when — our tradition teaches — the sap rises in the trees for the year to come, nourishing the trees so that in the future they can bear fruit. We too need to be nourished so that we can bear fruit as the year unfolds. As the trees need rain and snowmelt, we need the living waters of Torah to enliven our souls. As the trees need fertile soil and good nutrients, so we need to feel ourselves to be firmly planted — and to get all of the physical, intellectual, emotional, and spiritual nutrients we need in order to grow and to flower. What nourishment do you most need on this Shabbat? What would feed you in all four worlds — your body, your heart, your mind, your soul? What do you need to soak up in order to be able to bring forth the wonders, the ideas, the teachings, the kindnesses, the mitzvot which only you can do? And how can you take care of yourself, as Yitro instructed Moshe, so that you will be able to open your heart and receive what you need? 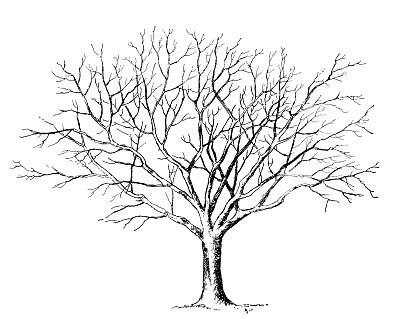 Join us next Shabbat for the New Year of the Trees! The New Year of the Trees is almost here! 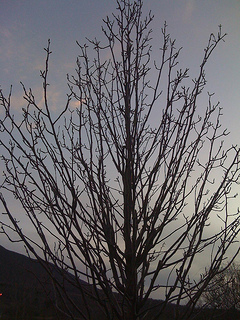 Late next week, when the moon is full, we’ll reach the festival of Tu BiShvat, also known as the New Year of the Trees. Tradition holds that this is when the sap begins to rise in the trees to feed the fruit of the year to come. We who live in sugaring country know about the rising of the sap and the sweetness which our trees can produce! But the sap rising at Tu BiShvat is more than merely literal — it’s also a spiritual reality. This is the time when we invite blessing and sustenance to flow into our parched souls, enlivening us so that we can spiritually grow in the new year. 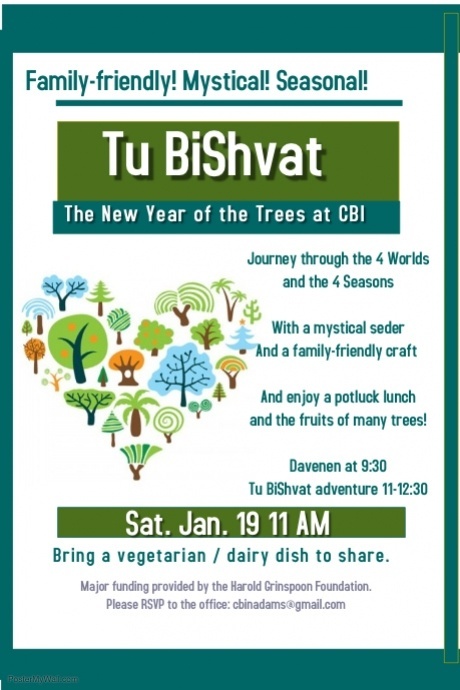 Here at CBI we’ll celebrate Tu BiShvat with a special seder at lunchtime on Saturday, January 18. 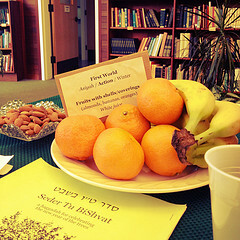 After our sweet Shabbat services (which run from 9:30 until 11), we’ll sit down for a Tu BiShvat seder in the social hall. We’ll bless and eat nuts and fruits which hold mystical significance, experiencing a journey through the “Four Worlds” of action / emotion / thought / spirit. As we eat these tree fruits with mindful intention, we open channels of blessing for the trees of our earth. As our seder concludes, we’ll segue into a vegetarian / dairy potluck lunch. All are welcome for both Shabbat services and the Tu BiShvat seder lunch — though if you can only make it to one of them, that’s okay too. Enjoy the waxing moon, and join us next Shabbat for Tu BiShvat!